Considerable clouds this evening. Some decrease in clouds late. A stray shower or thunderstorm is possible. Low 38F. Winds NE at 5 to 10 mph.. Considerable clouds this evening. Some decrease in clouds late. A stray shower or thunderstorm is possible. Low 38F. Winds NE at 5 to 10 mph. Medano Creek is just starting to flow at the base of the Great Sand Dunes. The creek typically reaches its peak flow in late May or early June, but it’s also a good place to cool down in summer. 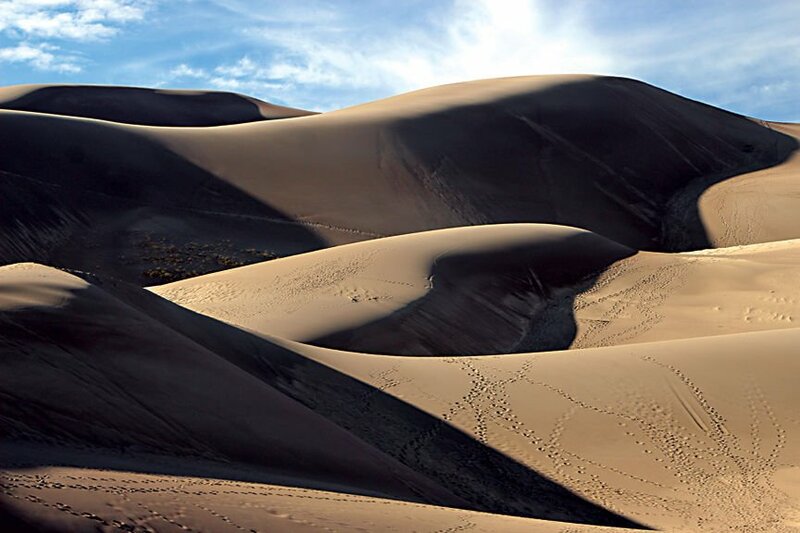 Some of the dunes in Great Sand Dunes National Park are more than 750 feet tall. Visitors hike around Great Sand Dunes National Park on Sunday. The dune field is 30 square miles and has the tallest dunes in North America. The dunes in Great Sand Dunes National Park are relatively stable since winds blow from two different directions, but they’re also unique and constantly changing. Standing in the middle of Great Sand Dunes National Park, surrounded by mountains of sand, feels more like being on another planet than in Colorado. The 30-square-mile dune field has dunes as tall as 750 feet, the tallest in North America and taller than Tenderfoot Mountain. Part mountain and part beach, the park is definitely unique. The sand even sings when millions of the grains tumble down hills in avalanches. The area is so much like another planet, specifically Mars, that NASA actually tests robots at the park. The cameras on two Viking Landers that touched down on Mars 30 years ago were developed and tested at the Great Sand Dunes. The association between the Great Sand Dunes and Mars continues to this day. NASA and Adams State University will host their 13th annual Colorado Space Grant Robotics Challenge Saturday at the park. The challenge will take place on terrain similar to where the Viking Landers captured their first images of Mars, in the Medano Creek bed, outside the dune field’s designated wilderness area. The sand at the dunes, she said, is what makes the area most similar to Mars, and it’s way different from what you might find in a sand volleyball court. “A lot of the robots don’t even move in the sand,” Viland said. The public can watch the challenge and robots navigate six areas with varying degrees of difficulty, from 8:20-10:45 a.m. The park will charge no entrance fee that day. The following Saturday, April 20, the park will also waive entrance fees to kick off National Parks Week, April 20-28, giving people a good opportunity to experience the dunes for themselves. The dunes will celebrate being a dog-friendly national park during the week, offering a guided “Bark Ranger Hike” for dogs and their owners. The park will also have guided sunset hikes in the dunes and evening programs at its outdoor amphitheater, including astronomy and star watching. Each day a porch talk is planned at the visitor center where people can learn more about the park. The visitor center also has a “solar scope,” a telescope with a special filter so people can look at the sun. Faz said they’re still finalizing the schedule for National Parks Week events, but the events will be listed at the park’s website, nps.gov/grsa/index.htm. Hiking the dunes is one of the more popular activities at the park. Closed-toe hiking boots are recommended, as are sunscreen and plenty of water. 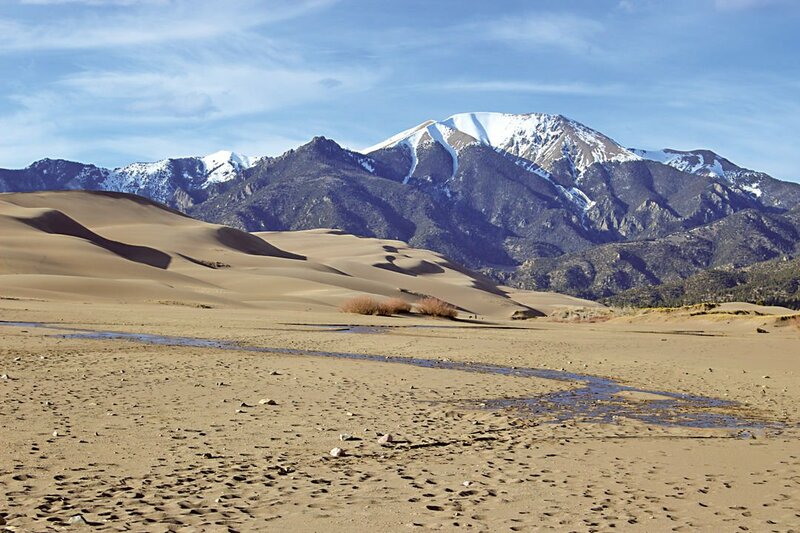 Medano Creek flows through the base of the dunes and offers more of a beach experience where visitors can build sand castles and enjoy cool water from melted snow trickling down from the mountains above. This is especially nice during the summer when sand temperatures can reach 140 degrees during midday. Hiking at night under a full moon is another way to avoid the heat. Of course, the park is still in Colorado and the weather acts similar to other mountainous areas, so visitors need to be prepared, especially this time of year. The park’s campgrounds are open now, from April 1 through Nov. 1, but Faz recommended making reservations ahead of time since they often fill up. Sliding down the dunes on specially made sand boards and sand sleds is also gaining popularity at the park. The park itself doesn’t rent the special equipment, but several spots close to the park do, including Sand Dunes Recreation Center in Hooper. The recreation center, however, is closed for maintenance through April 14. “With a sand sled or sand board you definitely have a higher probability of success,” Faz said, noting that plastic doesn’t slide well since the sand isn’t usually wet. The Montville Nature Trail, Mosca Pass Trail and Wellington Ditch Trail offer more traditional Colorado hiking experiences and views of the entire dune field. In general, Faz said the more research visitors do on the park’s website ahead of their visit, the better they’ll be able to plan their day and be prepared for what they may encounter. Admission to the park costs $25, but the passes are good for a whole week. The park is 90 miles from Salida, south on U.S. 285 to Colo. 17, Lane 6 and Colo. 150. The drive follows the Sangre de Cristo Mountains all the way to the park and features some interesting stops along the way. In Hooper, there’s a UFO Watchtower where people are said to have gazed into the sky and seen lights moving erratically and other objects that have defied explanation. The cost to visit the watchtower is $2 for individuals or $5 per car. Another anomaly for Colorado can be found along the way – alligators. The Colorado Gators Reptile Park in Mosca is a place where visitors can meet, pet, hold and take pictures with alligators. For the more daring, the park also offers gator-wrestling classes. Admission to the reptile park will be free on April 26-27. Regularly, admission is $10 for kids ages 6-15 and adults ages 65-79 and $20 for adults ages 16-64. Zapata Falls, a secluded 25-foot waterfall, is also just outside the park on Colo. 150.